Acting as the Federal Highway Administration’s (FHWA’s) agent, MoDOT must evaluate every project and determine whether it could have a negative impact on the base (1% or 100-year) floodplain and/or regulatory floodway. 23 CFR 650 defined the base (1% or 100-year) flood as the flood having a one-percent probability of being equaled or exceeded in any given year. The base floodplain is the area of 1% flood hazard within a county or community. The regulatory floodway is the channel of a stream plus any adjacent floodplain areas that must be kept free of encroachment so that the 1% flood discharge can be conveyed without increasing the base flood elevation more than a specified amount. FEMA has mandated that projects can cause no rise in the regulatory floodway and no more than a one-foot cumulative rise for all projects where the base (1%) flood elevation is given. A "No-Rise" Certification is signed and sealed by an engineer licensed to practice in Missouri that a project will cause no rise in the regulatory floodway of a given flooding source. This confirms that the project will not create any increase to the 1% elevations on said flooding source at published cross-sections in the Flood Insurance Study for a given community and will not create any increase to the 1% flood elevations at unpublished cross-sections in the vicinity of the proposed development. National Flood Insurance Act (42 U.S.C. 4001-4129 and 44 CFR 59-77) of 1968 provides previously unavailable flood insurance protection to property owners in flood-prone areas. National Environmental Policy Act (NEPA) of 1969. The district must complete and submit a Request for Environmental Services (RES) to the Design Division’s Environmental Section. Upon receiving an RES from the district, the environmental specialist will determine whether the community or county in which the project is located has been mapped by FEMA for floodplain and floodways. If the community or county has not been mapped by FEMA, floodplain permitting is not required. This is communicated to the district via the RES. If the community has been mapped, then the environmental specialist will identify the extent of encroachment, if any, into the 1% floodplain and/or regulatory floodway and whether the community or county participates in the National Flood Insurance Program (NFIP). 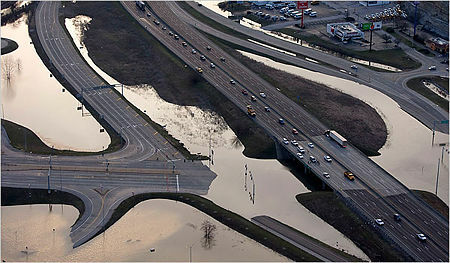 If there is to be an encroachment into the 1% floodplain, MoDOT must obtain a floodplain development permit from SEMA. If there will also be an encroachment into the regulatory floodway, MoDOT must issue a "No-Rise" Certification as required by SEMA to obtain a floodplain development permit that is needed for any encroachment into the 1% floodplain. As indicated in the RES response, the environmental specialist will communicate this information to the district, which will then take the appropriate steps, often in consultation with the Bridge Division, to obtain the necessary permits. If the action will affect the base floodplain, as determined by 23 CFR 650.107, the environmental specialist will also include an evaluation and discussion in the NEPA document or RES as required under 23 CFR 650.111(e). When the district submits the Location/Conceptual Plans RES, the environmental specialist will identify whether the project is located in a county or community that participates in the NFIP and the extent of the encroachment, if any, into the 1% floodplain and/or the regulatory floodway . If the project will encroach upon the 1% floodplain and/or the regulatory floodway, the environmental specialist will communicate this to the district via the RES response. When the district submits the Preliminary Plans RES, if floodplain impact was not previously evaluated, the environmental specialist will identify whether the project is located in a county or community that participates in the NFIP and the extent of encroachment, if any, into the 1% floodplain and/or regulatory floodway. If the project will encroach upon the 1% floodplain and/or the regulatory floodway, the environmental specialist will communicate this to the district via the RES response. When the district submits the Final Design Plans Stage RES, floodplain impact should have previously been evaluated and any required floodplain development permits and “no-rise” certifications should already be obtained. If floodplain impact was overlooked and has not been evaluated or if there has been a change that may cause the project to encroach upon the 1% floodplain and/or regulatory floodway, the environmental specialist will identify whether the project is located in a county or community that participates in the NFIP and the extent of encroachment, if any, into the 1% floodplain and/or regulatory floodway. However, the project may be delayed since any required floodplain development permit and “no-rise” certification must be obtained before letting occurs. Floodplain/Floodway impacts must be known prior to letting and any required floodplain development permits and "no-rise" certifications must have been obtained. The project may be delayed until these permits are received. This page was last modified on 4 December 2018, at 16:04.